Strive to lead a fit and fresh life! Trim fat from pork shoulder and cut into 1-2 inch pieces. Coat bottom of crock pot with coconut oil. 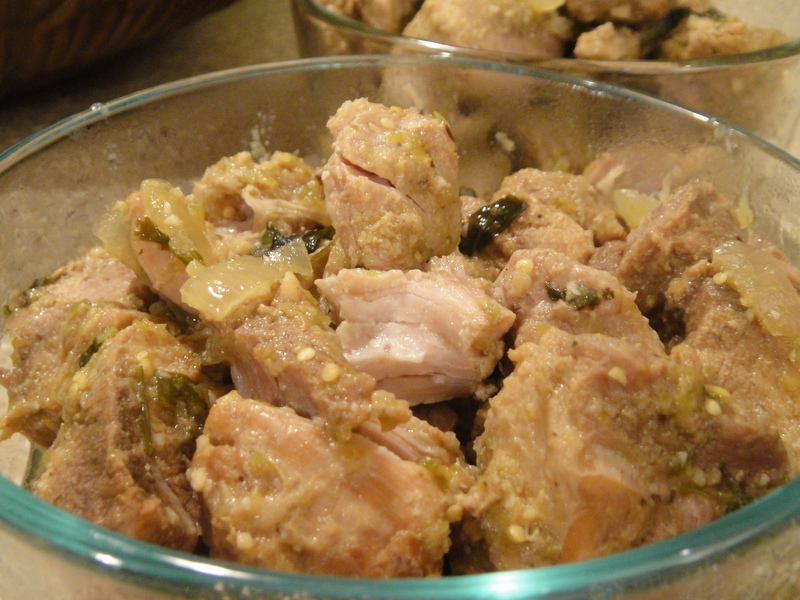 Toss diced pork with 1 head minced garlic and onion slices and salt and pepper to taste. Place coated pork in crock pot. Start slow cooker on low-heat setting while prepping salsa. Slice tomatillos in half (removing outer paper skin if necessary). Place quartered tomatillos and diced jalapenos on baking sheet lined with foil and broil until slightly browned on top. Place tomatillos, jalapenos, minced onion, other half of minced garlic, chicken stick, lime juice, and spices in large bowl. Use a blender or immersion blender to mix and create salsa. Top pork with salsa and cook 6-8 hours on low setting. Add cilantro about halfway through cooking time and stir. This recipe also makes quite a bit, so if preparing for 1-2 people, transfer half of the meat into freezer-safe storage container and freeze until ready to enjoy again.